Replica of Harald Bluetooth’s rune stone in Viborg. Photo: Anne Pedersen. 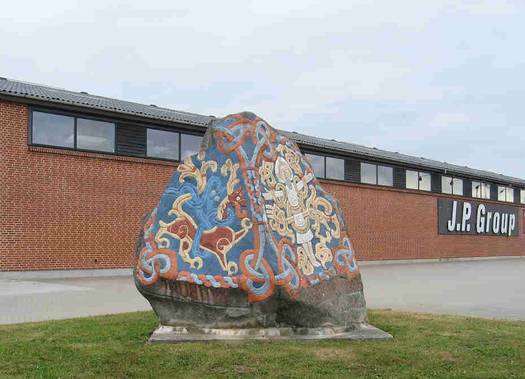 A replica of King Harald Bluetooth’s rune stone in Jelling is to be found unexpectedly in front of the office buildings of the JP Group on Vognmagervej, in the northern outskirts of Viborg. It stands there with replicas of two ancient lions from the Syrian city of Hama. The replica of the rune stone made by the JP Group was commissioned by Moesgård Museum, near Århus, for a special exhibition. The replica is hollow and made of glyptonit, a material with properties very close to those of sandstone. The moulds for the cast were based upon original impressions of silicone rubber. The glyptonit was coloured so as to resemble the original rune stone. The colour scheme was reconstructed by Moesgård Museum. 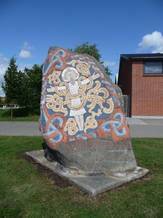 The rune stone in Viborg, view showing the side with the Christ figure. The two lion copies in Viborg.